What a sight from the coastal steamer this early afternoon - closing in to this big city up in the Arctic - looking at the bridge connecting the city to the mainland - having in front the city line with the Majestetic white dressed mountains in the back. Already the light is fading at 14.15 PM in this time of the year (end of January). 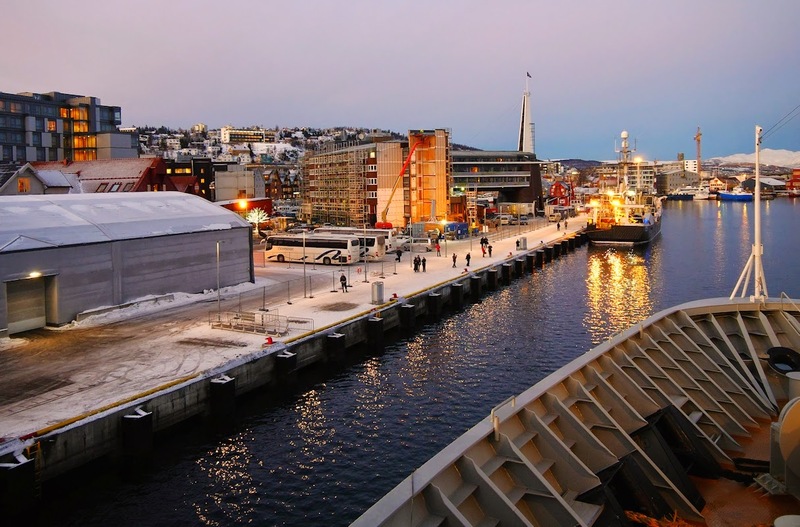 Facts and figures of Tromsø Tromsø has a population of about 70,000 and covers an area of 2,516 square kilometres. Tromsø is home to the world's northernmost university, botanical garden and cathedral. History Human settlement in Tromsø dates back more than 10,000 years, whilst the local Sami culture is at least 2,000 years old. Tromsø became the centre for trapping in the Arctic region. In the early 1900s, it was the starting point for expeditions to the Arctic and Antarctic regions, hence its nickname - "Gateway to the Arctic".